Chicago weddings, Xoco, and art! Even after going through my hooding ceremony, I'm pretty sure I'll always be ready to learn something new! In that way, I'm totes going to live my life as a perpetual student. This outfit was fully inspired by that idea. That, and I felt like working out a preppy, nerdy vibe. The glasses and the child's sweater definitely take this outfit a tad over the top. But that's what's fun about it. Nerdy, fun and comfortable. This was highly appropriate given that I spent the afternoon in a coffee shop working on some data analyses. I know that the Every Body Every Wear theme is yellow today. And this outfit looks more green than yellow. But, hey! Look! That is a large swath of yellow there in the middle of the sweater. So I call it good! * I'm now a pescetarian nerd. I decided to keep eating fish because I've been making and loving ceviche every week. Fresh rockfish from the farmer's market has been AMAZING! Does anyone have any awesome seafood or vegetarian recipes they'd like to share with me? Pretty please?! * Ev and I celebrated 4 years of marriage last week! * I gave blood and found out I have A+ blood type. The nerd in me was excited because it sounds like an awesome grade. My dad's response? "Not sure if I have A+ too but I think I have phi beta capillaries with Distinction." LOL. Now y'all know where I get my kooky humor. * Budz had an oncology checkup and his ultrasound and x-rays came back clean (no cancer recurrence)! Woohoo! Heya Lori! Wow, you make a great nerd...hehe. 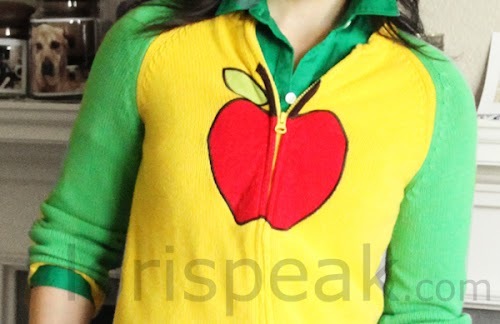 That apple green and yellow hoodie is sooooo cute. You are adorable. I love that moving image of you- so fun! I'd love to make one of those. I love fish meals. One easy fish dish is to steam the fish, then top it with green onion shallot, the pour soy sauce and hot oil on it. May be too simple though! Congrats to you and Ev on your 4 years of marriage! You're adorable. I think that qualifies nicely as a yellow submission! 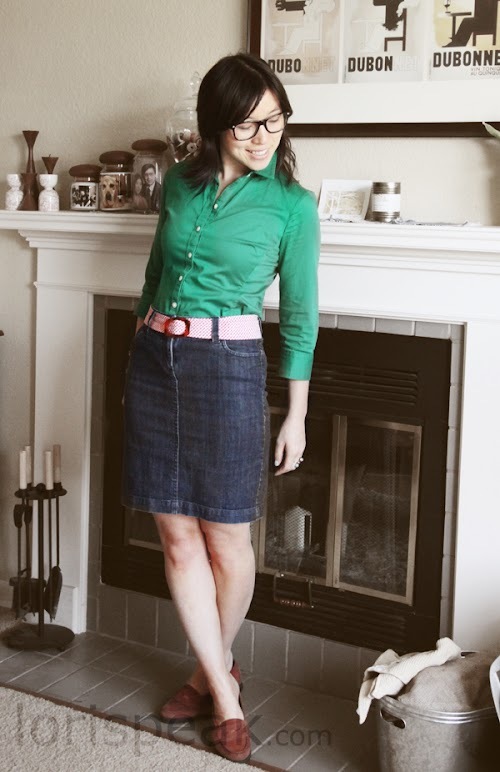 I love that denim skirt too. I always forget to ask about my bloodtype at the doctor! You'd think I'd know considering that I got stabbed with needles every thirty days when I was taking accutane a couple years ago. I think I'd be excited to be A+, too, though. Your dad's comment was too funny!! It's great to hear Buddie's doing better. I love ceviche! If my fiance had it his way, we'd be eating it everyday. But it would probably be pretty bad for us being that he's very fond shrimp ceviche. I've been on seafood kick too! Its been one of my favorite things about moving recently to the northwest. Just got some great salmon from our farmer's market. Anyway my current fav recipe is for shrimp (but sure you could sub in what sounded yummy). Followed recipe except added whatever fresh herbs were in fridge at time (thyme and basil) and added in a few handfuls of spinach in with the tomatoes... and reduced feta amount (like feta but a little strong for me sometimes) Add some crusty bread and wine and call it dinner :o) HTH! That sweater is AMAZING! What a fabulous EBEW look! I love it! Enter our giveaway for a $50 Visa Card! Hi Lori! There is so much to love about this post. First of all, can I meet you dad? He sounds absolutely hilarious -- that is definitely my kind of humor. And hooray for your pup's clean bill of health -- that is such great news! This outfit is too adorable. I absolutely love it!!! I'm thinking you look more like a Teacher. 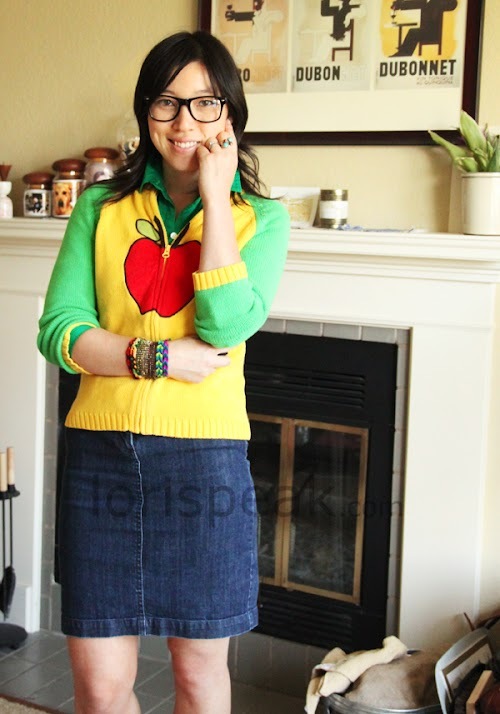 After all, students give the prettiest Teacher the Apple. The multi set of bracelets looks more student-ish though. I would love to know how you did the magical photo. That is too cool for words Lori. It's probably a page of html I would never be able to decipher. You really can't ask for better news about Budz. He's a fighter and is lucky to have a wonderful Human Mommy like you.